At the screeching of brakes I glanced through the kitchen window, just in time to see a van swerve into the farmyard, and its driver leap out to sprint away from the vehicle as though it contained a ticking time bomb. Intrigued, I dashed outside to see what was going on. The van’s flustered driver was well known to me. Red faced and muttering, he blurted out that he had just come within a hair’s breadth of death, only narrowly escaping a fearful mauling by the beast in the vehicle. What could this animal possibly be, that had so nearly caused my friend to meet his maker? Approaching the little van I was advised to exercise the greatest caution, for once the vehicle’s door was open one careless movement on my part could cost me my life. Peering through the passenger-side window, I fully expected to be confronted by a razor-backed wild boar or ravening wolf, but instead saw nothing. The front of the van was quite empty. Then, as I continued to look around the interior, a movement caught my eye, as slowly, steadily, from beneath the driver’s seat, there appeared a twitching pink nose, accompanied by a fine set of sandy coloured whiskers. As I stood open mouthed, the largest ferret I had ever seen emerged from under the seat, blinking in the daylight and yawning widely. I had seen large ferrets before, and even possessed a few splendid specimens myself, but this colossus was in a class of its own. It was huge, nearing the size of a small otter. Sleek, male, and with a luxuriant sand coloured coat, the huge hob reared up against the passenger door, sniffing the glass and showing a fine set of fangs. Astonished, I turned to my friend and asked how he had come by the animal. 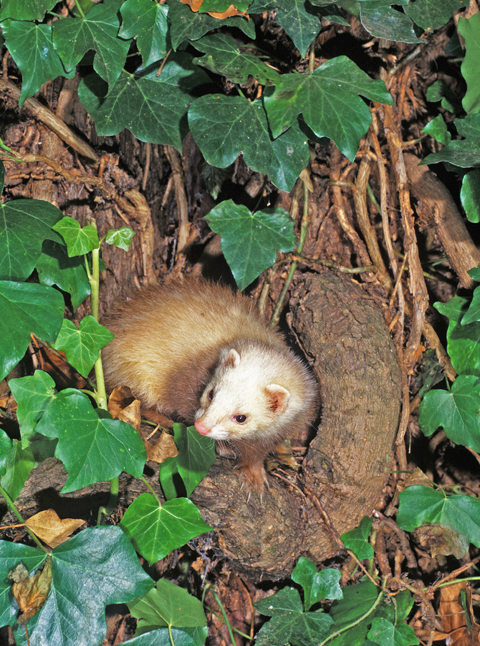 He explained he had been driving down a lane which ran by an area of common land when he spotted the enormous ferret. I knew the place well, for it was sometimes used by Romanies for grazing their ponies. Could this explain the ferret’s presence? Had it perhaps escaped from its owners, only to be left behind when they moved on? My friend explained how he had captured the beast in an old hessian sack. This done, he placed the wriggling animal in the back of the van. Knowing I would appreciate a good working ferret he then headed across to the farm. But the hessian sack was old and simply not strong enough to contain its prisoner for long. Within two minutes, the sharp-clawed escapologist had torn its way out to join the driver up front. The first my friend knew of the creature’s escape was when it climbed up the back of his seat and scrambled over his shoulder down into his lap: at around 60mph. Ferrets, like humans, come in different sizes and with different personalities. Needless to say, the animal gave him quite a fright. From the driver’s lap the huge ferret scrambled up onto the steering wheel, and thence to the dashboard, where it proceeded to run up and down excitedly. Clearly it hadn’t had so much fun in ages. My friend had. At this point the ferret must have become tired from all its vehicular gymnastics, and decided it was time for a little nap. Yawning, it slithered down my hysterical friend’s right leg and curled up under the driver’s seat like a python. Now here it was and one of us had to do something, so, taking a step forward, I gingerly opened the van’s door. The ferret simply sat on the passenger seat and looked at me with dark, blinking, bead-like eyes. Clenching a fist I slowly offered it a knuckle, for if it was to bite, it would get little. The animal sniffed my knuckle and then proceeded to lick it; so with a deep breath I leant forward, put my right hand under the ferret’s chest, and scooped it up into my arms. There, this terror, this scourge of the mini van, this bloodthirsty beast, curled up like a kitten and went to sleep. This was my introduction to the greatest ferret I have owned. Harry, for he was named after Houdini the great escapologist, was as gentle as a lamb, and had clearly been handled to perfection. He would follow me around like a dog, and seemed to genuinely enjoy both people’s company and affection. If, when out ferreting, a rabbit refused to bolt, he would grab hold of it and drag it to the surface for me to dispatch. He was a treasure beyond rubies. When happy, which was most of the time, he would emit a chuntering sound, as though he were chuckling under his breath, and he liked nothing more than a race around the sitting room followed by a game of hide and seek. Sadly he is no longer with us, but to the Romany who bred him and handled him so well I would like to say a heart felt thank you. You allowed me to know one of the most amazing creatures it has ever been my good fortune to meet.